Hampton Inn by Hilton, Toronto Airport Corporate Centre features an indoor saltwater pool and a 24-hour fitness facility. WiFi access is complimentary. 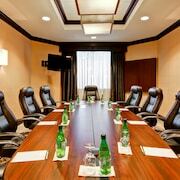 Business-related amenities at this 2.5-star property consist of a 24-hour business center and audio-visual equipment. Feeling social? Our Lobby offers a mix of casual meeting areas, comfy lounge chairs and dining tables. A complimentary breakfast buffet is available each morning offering healthy options including hot oatmeal, waffles, and other favorites. Enjoy gourmet coffees and teas at the beverage station in the Lodge 24 hours a day. Event facilities include conference and 6 meeting rooms for small to medium size groups with full catering services available. The spacious Ballroom is a perfect wedding venue. Other complimentary services for guests include a 24-hour airport shuttle and a corporate shuttle to business facilities within a 5 mile (8 kilometer) radius of the hotel. The hotel also provides an onsite mini convenience shop and offers barbecue grills and a garden. Feel the Hamptonality! We anticipate your needs & exceed your expectations. Located at the Airport Corporate Centre, this airport hotel is close to major businesses in Mississauga, Etobicoke, the Toronto Congress Center, the International Centre and within minutes of downtown Toronto. Enjoy excellent value with free airport shuttle, free breakfast, free high-speed internet, free local calls and more. 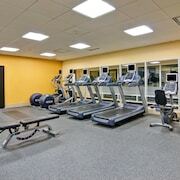 Relax in the indoor pool and work out in the Precor Certified fitness room. Relax in the comfort of Hampton's famous "Clean and Fresh Hampton Bed." Rooms feature a flat screen TV, HD channels, fridge, in-room safe, and spacious work desk. Free cribs also available. Hampton Inn by Hilton Toronto Airport Corporate Centre offers 126 air-conditioned accommodations with MP3 docking stations and laptop-compatible safes. Beds feature pillowtop mattresses. LCD televisions are featured in guestrooms. Refrigerators, microwaves, and coffee/tea makers are provided. Bathrooms include complimentary toiletries and hair dryers. This Toronto hotel provides complimentary wired and wireless Internet access. Business-friendly amenities include desks and complimentary weekday newspapers, as well as phones; free local calls are provided (restrictions may apply). Additionally, rooms include irons/ironing boards and blackout drapes/curtains. Housekeeping is offered daily and hypo-allergenic bedding can be requested. Guests are offered a complimentary hot and cold buffet breakfast. Located conveniently nearby are numerous restaurants offering a variety of taste choices. Some also offer discounts to our guests.